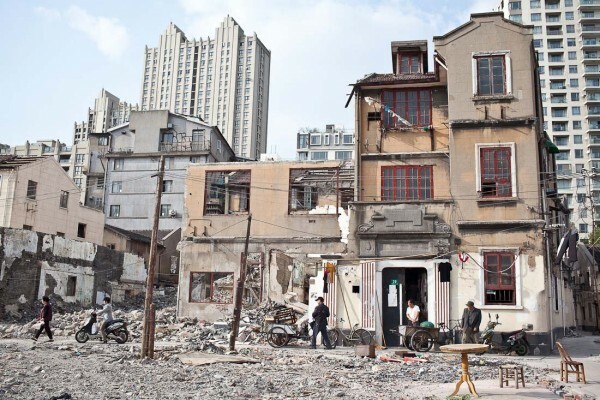 Buried amidst the largely demolished Chengyu Lane (成裕里) (or Achieving Abundance Lane) on Fuxing Zhong Lu (复兴中路), a mountain of debris hid a small piece of the Chinese Communist Party’s (CCP) humble beginnings. 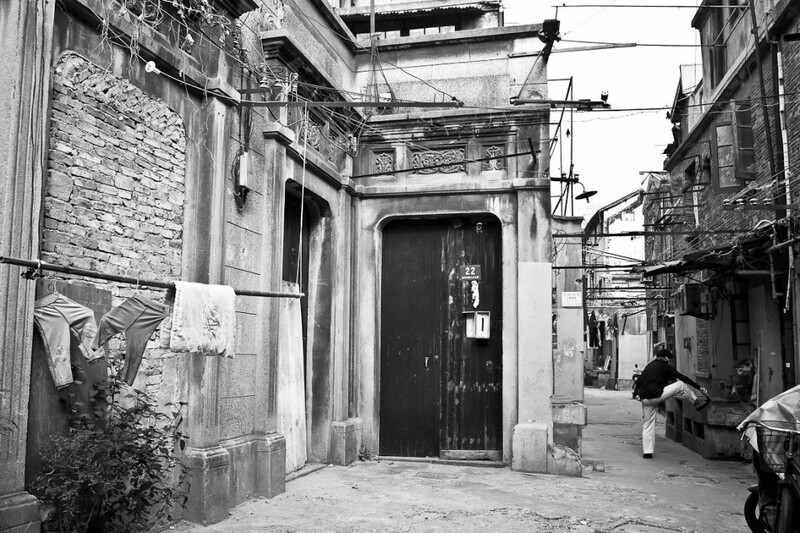 The shikumen (石库门) houses in this part of Chengyu Lane were not elaborate, their headers were a simple rectangular frame with European flower motifs. Typical of the lilong (里弄) layout, they faced the back of another row of houses where neighbors would cook and lounge in the main alley, privy to the comings and goings of other residents. I’ve passed through this lane many times and encountered a middle-aged woman who lived in the back of House no. 12 on Lane 221 off Fuxing Zhong Lu. The first time, she was rinsing vegetables in an open sink. Another time, she was holding court with remaining residents as demolition of the area went underway. The last I saw her, she was staring listlessly out her window that was laced with a thick sludge-like layer of cooking grease accumulated over the decades. Our interaction was fleeting. Her accent was strong and speech rapid – all I caught was “the Party” and “history”. At that time, I was impatient to move on to a more magnificent shikumen villa round the corner. I simply assumed that like many hold-outs in a neighborhood destined to be razed, she desperately sought to emphasize any modicum of historical value that might appeal to the sympathies of a passer-by. But we both knew it was only the commercial worth of the real estate that would overrule. In the same vicinity half a year later, I dusted off a heavy piece of stone carving that had broken off a shikumen header. I recognized the flowery motif instantly. 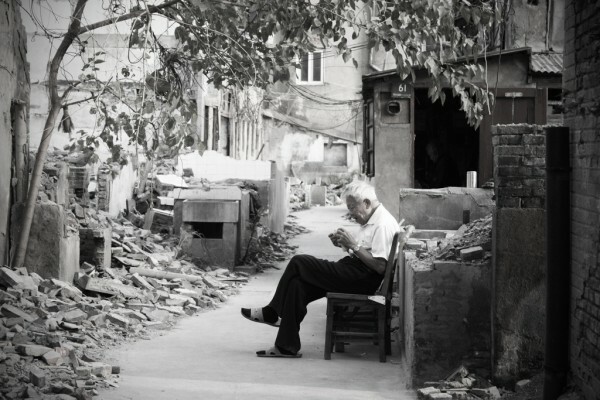 Months went by, revealed in the esoteric circles of nostalgic Shanghainese who monitor the demolition old neighborhoods around the city, I finally understood what the woman was trying to tell me. 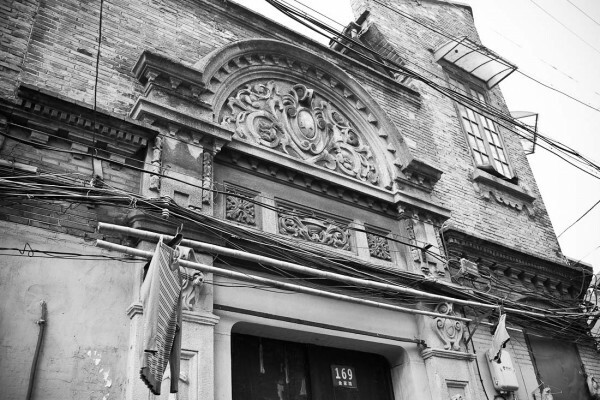 According to Lu Hanchao’s Beyond the Neon Lights: Everyday Shanghai in the Early Twentieth Century, there were six hundred recorded printing houses and bookstores in pre-1949 Shanghai. More than half were set in lilong neighborhoods, mostly in shikumens properties. The dense layout of lilongs and its bustling activity of businesses and residents allowed the CCP to operate discreetly. Even when the Party was forced underground by the Kuomintang’s (KMT) Chiang Kaishek following a brutal massacre of 5,000 Communists in 1927 under his order, the Party continued to hold clandestine meetings and produce secret publications in the labyrinth of shikumen compounds. The Shanghai Bookstore, CCP’s press from 1923-26 was in a lilong neighborhood north of Old Town, the magazines New Youth (新青年), Chinese Youth (中国青年) and Guide (向导) were printed in a lilong near the Garden Hotel in the French Concession. From 1917-32, the CCP’s masthead journal Bolshevik (布尔什维克) was printed in a lilong off Yuyuan Lu (愚园路). Still, the Settlement Police managed to raid the printers of the CCP’s key journal Red Flag (红旗) operating out of a shikumen in 1929. Magazines New Youth (新青年) (left) was first launched in 1915 and was one of the most influential magazine among supporters of the May Fourth Movement in 1919. 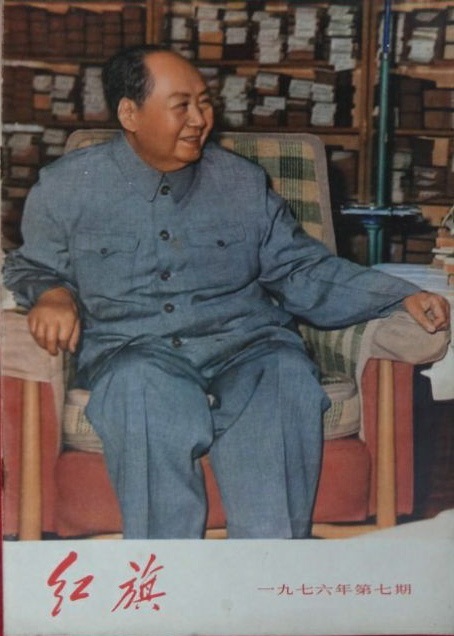 Red Flag (红旗) (right) is the CCP’s key journal and was published up to 1988. It was in Chengyu Lane that Chen Duxiu (陈独秀) (1879–1942) assembled a printing press in House no. 12 to produce the first Chinese copy of The Communist Manifesto in 1920. Chen was one of two founding members of the CCP and an early student of Karl Marx’s works. Prior to that, he was a leading figure in the anti-imperialist Xinhai Revolution and the May Fourth Movement. Yet Chen’s legacy within the Party is largely diminished as compared to the cult personality of Mao Zedong, whom Chen had clashed with over differing visions of Marxism in China. Chen was eventually ousted from the CCP when the coalition he initiated with the KMT fell apart in 1927. He survived the turmoil of the Civil War and the Sino-Japanese war but never regained entry into the Party he founded. Eventually, bereft of influence and friends, Chen ended up in a small town in Chongqing in 1938 to teach, quietly passing away in 1942. 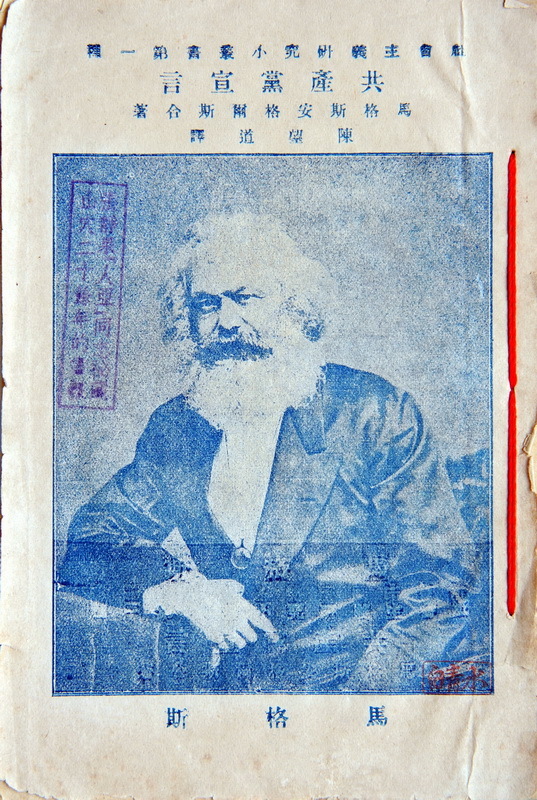 Nevertheless, Chen was instrumental in introducing The Communist Manifesto to many Marxist supporters in Shanghai. He worked tirelessly on it with Chen Wangdao (陈望道) (1891–1977) who initiated the first draft of the translation and the CCP’s other founding member Li Dazhao (李大釗) (1888 -1927). In August 1920, 1,000 copies of The Communist Manifesto were quickly sold out. Another 1,000 copies were hurriedly printed the following month. The CCP was only formally established a year later, its first Party Congress meeting held in another shikumen now housed in the shopping district of Xintiandi (新天地), not far from Chengyu Lane. Structurally, shikumen houses sometimes do not display any outstanding characteristics as they were mainly built (some hastily) as common row housing. 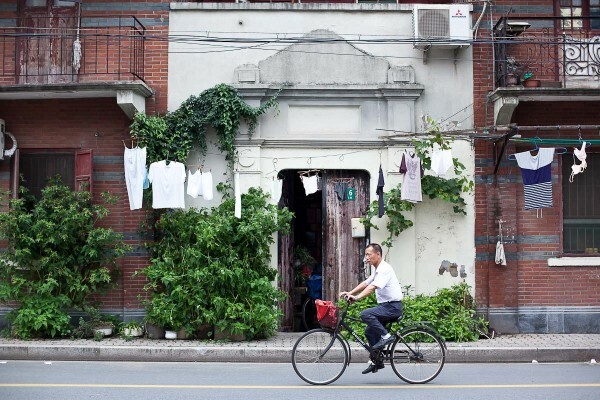 But they do embody important fragments of Shanghai’s modern history. As far as the old lady was concerned, her home housed an integral aspect of Party activity even before its founding. 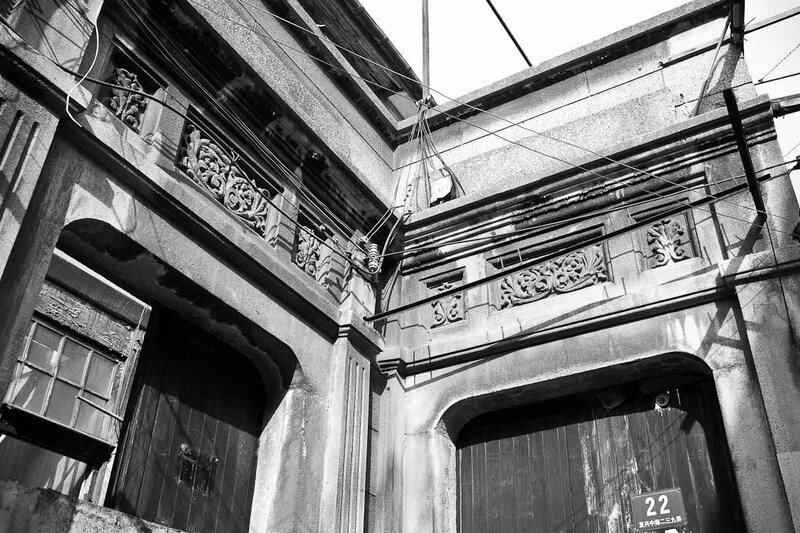 Luwan district was merged under Huangpu district in June 2007, and judging from the flattened neighborhood, the printing press’ heritage status was voided and now surely forgotten. Hi Mackenzie, thanks for your email! I’m traveling a fair bit over the next few months, but feel free to send me your work portfolio e.g. website, stream with some commentary. I’ll be happy to share them on the blog FB page. 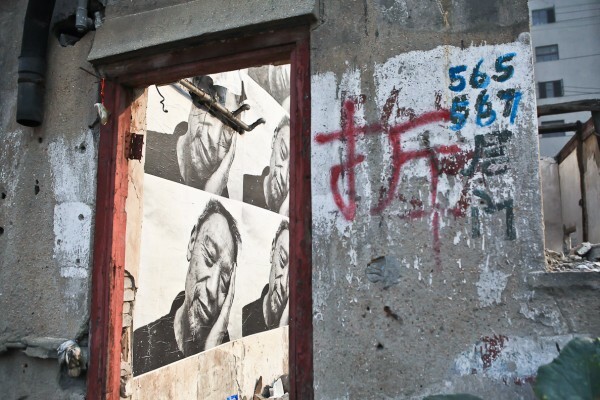 Documenting Xiaonanmen and other parts of Old Shanghai is an ongoing team effort. Sue, thanks for this blog, we found referenced in Lonely Planet guide. We have been visiting for a week in Shanghai. Besides the impressive modern, functional, luxurious city , we have been deeply touched by the irreversibility of the process of destruction of tradicional housing . In the remaining lilon blocks , left aside the fancy ones downtown, where I suppose middle-high class people live, we were very much susrprised to see the lively remaining lilongs in more peripheral areas. Street markets, full of shops selling alive fish, poultry, ducks….families, neighbours sharing their daily lives. These areas are surely not rich, we, as occidentals, may find them dirty and even filthy in some cases, by occidental standards, but, , to my eye were not miserable, as you can see in other asian countries. The worst was to advance a few blocks and see the destruction of very similar neighbourhoods to build tremendous housing blocks or shopping malls ( many of which we have seen virtually empty…there are so many, even for such a populated city…) . When you become in a few decades one very rich countries , I am sure all this destruction will be regretted and, worst of it, it will be irreversible. Most of these reflections came from a visit to Honghkou, visiting the remains of the Jewish quarter, crosssing the lively street market of dongyuhang stret and walking westwards towards the 1933 building. In our way we could se many examples of this relentless irreversible process of destruction, which I suppose I do not need to explain to you but, to us a s Occidentals is very shocking. We have suffered similar processes of destruction of our cultural heritage in our countries ( we come from Spain ) , but never in such a spatial and temporal scale. 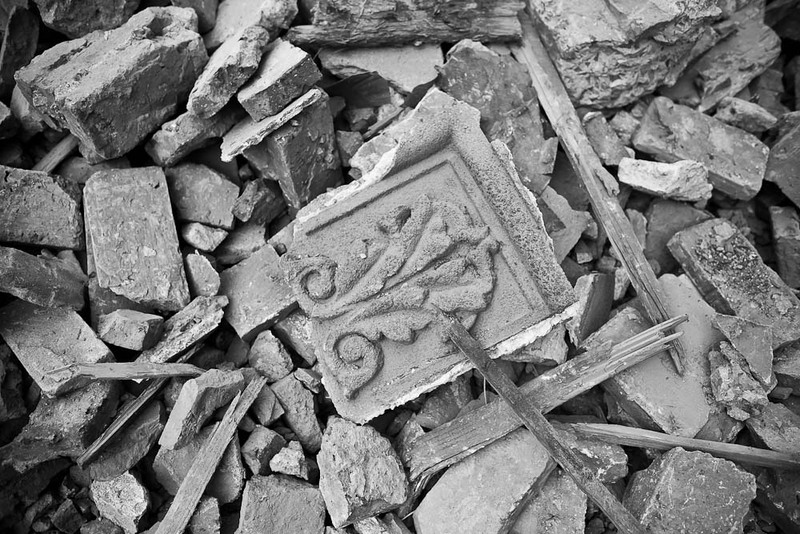 This response was mainly to tell you in one of these half destroyed rows of houses, ( probably at the western end of dongyuhan rd close to zhoujiaji rd ) we found a beautiful , rather well preserved art-deco lintels miraculously reamining among the ruin of the mostly toppled building. In case you are interested, I would like to send you the picture, if you tell me the way to do it. Thanks, and congratulations for your work. shanghaistreetstories_at_gmail.com. I would also share this with my friends who follow this closely. I’m delighted to hear that you visited Hongkou, and the part around 1933 and the Jewish Quarter are one of my favorites, I have always found the area a very even mix of traditional and modern flavour. Your descriptions of street life and local community are vibrant and accurate, they are not only diverse in activity but people – local Shanghainese and migrant families from neighboring provinces. This is not always clear to visitors, even myself, unless you speak with them at length. And your point about the pace of destruction and development is spot on, the rapidity of change in a city like Shanghai is a core theme of China where change is the only constant, nothing quite like what Europe has seen. American saw its boom years but never had to tear down the past like China is doing now. The balance we seek in modernisation and preservation is a precarious one tipped in favor of the former by powerful forces, the latter suffering in obscurity despite select efforts at the local government level and passionate advocators. I could speak more but happy to continue over email.